Talk about a jam that practically no one has ever tasted before. I don’t understand why this isn’t on the grocery store shelf since it is a common fruit. 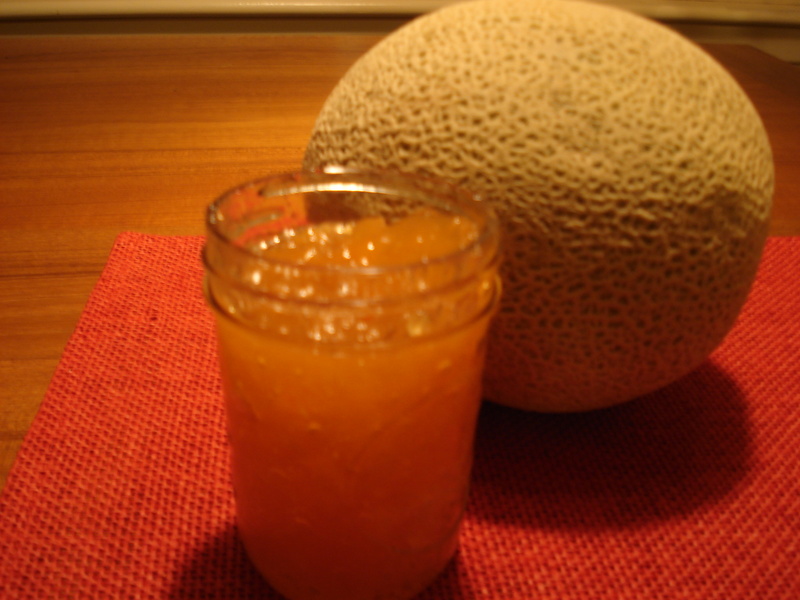 Cantaloupe has a distinctive flavor and that flavor carries over well to the jam. I can still remember the day when I was 6 years old and went out into a farmer’s field with the farmer in order to pick what he called muskmelon. I remember him pulling out a pocket knife out of his pockets with his large rough hands. He reached down to the field in front of us and picked up a melon. It seemed to me that there were melons everywhere but he told me that he had already picked the field and these were the ones that were too ripe, too big, or too small to have been picked. The sun was burning down on us that day as he split that muskmelon open with his knife. He handed me a piece. It was the first time I had ever eaten fruit in the middle of a field. Well, it was the sweetest, cool fruit I ever have eaten. So now I have the opportunity to put a little of that flavor into a container of jam. 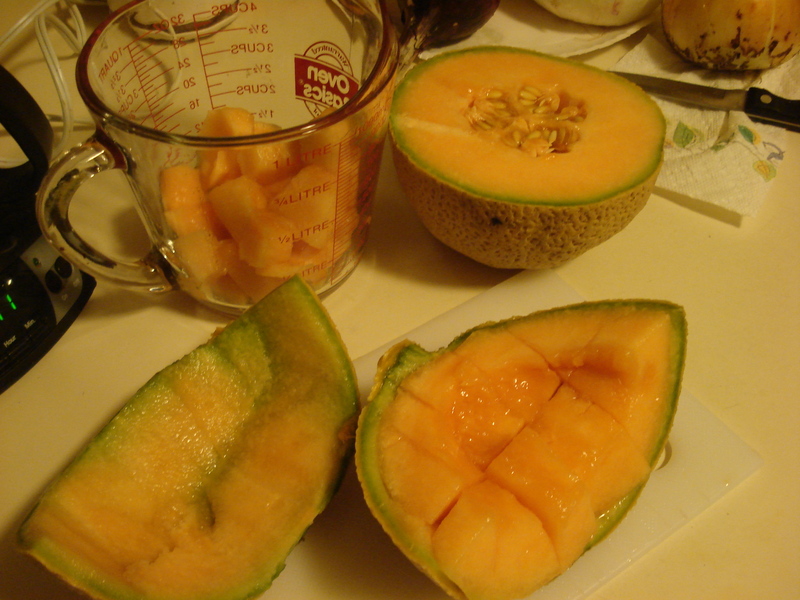 I washed and sliced up one cantaloupe into many pieces. I then put it into my cooking pot along with lemon juice. I brought it to a boil, mashing the fruit all the while. I then added the no sugar-needed fruit pectin. When it was at a hard boil I added the sugar. I let it boil at a hard boil for 3 minutes. After cooling it was poured into freezer containers. My wife tasted it while it was still warm and pronounced it super delicious. That is no small announcement since she is my most strict critic. Gallery | This entry was posted in Recipes and tagged cantaloupe jelly, fruit memories, unusual jellies, unusual jelly. Bookmark the permalink. how much sugar for the cantaloupe jam? You will find this a wonderful jam. 3 cups sugar. I brought it to a boil, mashing the fruit all the while. I then added the no sugar-needed fruit pectin (3 cups). When it was at a hard boil I added the sugar. Then I bring it to another hard boil for at least a minute, then cool, put in containers and freeze. Abbie- Glad you are trying the recipe. The recipe makes approximately 4 cups of Cantaloupe Jam. Just made it and want to thank you for a simple, delicious recipe. Wanda- Glad you enjoyed the recipe and jam. All of my recipes, as written, are for freezing. I am glad you visited with us. Happy jelly making. Thank you for writing, Shannon. The reason I freeze the jams and jellies is in order to keep them for a longer period of time. Even though I love jams and jelly we don’t consume that much so I freeze most of it so it will not go bad. If I don’t have other jelly or jam in the refrigerator I will put some in a jar and refrigerate it. If I keep too large of supply in the refrigerator it will eventually start to mold. I work too hard making it to let it mold on me. Thus I freeze most, if not all, of the jam or jelly. If you have lots of family or friends perhaps you will use it up very quickly and won’t need to freeze it. In regards to how it does in the freezer, it keeps fine for a year. The jams or jellies become more runny (when defrosted) the longer it is in the freezer. I have had jams and jellies still good longer than a year but I try to get everything used within a year. Christmas usually finds me giving away lots of frozen jams and jellies. Rosealee- I like the idea of added plums. It would give some tartness to a rather sweet jelly. Thanks for stopping by. it’s not overly sweet… just right to the taste. Glad you liked it. Enjoy! Yes, you can process this jelly in jars (hot water bath) style. However, the color becomes much darker. It tastes MARVELOUS !!!! Thank you for your comments on making this jelly in jars (hot water bath) style. You are right about cantaloupe jam tasting great. One of the things that amazed about making jellies is that many the unusual jellies turn out so delicious. WAIT … Are you saying that you ARE able to “can” these, as in not freeze? I’ve just started learning to ‘can’, so if I can do that, I’d like to do that. All my recipes are for making freezer jams and jellies. There are not many recipes out there for cantaloupe jam for canning but I did find some when I searched right now on the internet. When I made my Cantaloupe Jam recipe I just followed my standard recipe for low or no sugar freezer jam. Canning often requires a different level of acidity that one doesn’t have to worry about when freezing. I just got done making this jam! So goood… would have never thought to make Jam out of Cantaloupe, but I’m sure happy I made it. Thank you for sharing this unusual yet yummy recipe! Happy Canning everyone! Glad you enjoyed the jam. It sure was a surprise to me too. Now you should try the zucchini jam. That will knock your socks off. I did it on a dare but the laugh was on those who dared me. My friends are like.. .Here is some tree bark, make a jelly with it. 🙂 But they always like the jellies I come up with. Of course, they are can’t wait until I start making wine. I’ve also made cherry jam as well as muskmelon and plum jam years ago but lost the recipe. Zelpha- Ah, Cherry jam. That sure takes me back to my youth in Indiana. I don’t have access to cherries here in Central Texas (except at the grocery store) so I haven’t made any Cherry Jam in a long time. 4 cups chopped cherries. You can use a food mill to chop them (after cooking them) as well as remove the pits. Then follow my standard recipes for when to add pectin and sugar and cooking times. i dont like using the powder pectin. how much liquid pectin could i use? Jessica- 2 tbsp. of liquid pectin required for every 4 tsp. of powdered pectin. Happy jelly making. I am very new to canning and making jams and jellies! Why do you use the no- sugar needed Pectin but add 3 cups of sugar? Is there a difference? Thank you for visiting my site. Good question. Standard jelly recipes use 5-6 cups of sugar. I don’t want that much sugar in my jelly. On the other hand, many jellies simply taste better with sugar. Some fruits are so tart that sugar is a necessity. Even the no-sugar pectin recipes recommend using sugar so it will jell better. No-sugar pectin jelly tends to be less stiff in consistency than standard jellies as it is so I don’t want it to be even more runny. Hope you enjoy the cantaloupe jelly. Let us know how it turns out. so can you use the regular pectin instead? I have plenty of the regular pectin and none of the no-sugar on hand. If so, how much sugar would you use? I had an Aunt once who made jelly from the hulls of purple hull peas. It had a pretty purple color and tasted very similar to grape jelly. Thank you for visiting the site. Purple Hull Pea jelly is a jelly I have not heard of before. I find it interesting that the jelly is made from the hulls rather than the peas. Talk about “waste not want not”. I can imagine that it was a tasty and pretty jelly. I was surprised to find out that every year there is a purple hull pea festival in Emerson, Arkansas. I will have to put that on my calendar for next year since I want to see the tiller races. In reading their website I discovered not only is there Purple Hull Pea Jelly but there is Purple Hull Pea cornbread, and Purple Hull Pea salsa. Who knew? I will have to get some purple hull peas and plant them in my garden. I have to admit I haven’t eat Purple Hull Peas but people in our community garden to grow other varieties of cow peas that seem to do very well here. Thank you for introducing me to a new type of jelly! Thank you so much for posting/creating this recipe! I have so much cantaloupe this year and it is such a waste when we cant eat it all before it goes bad. I usually make jams and jellies and give them to family and friends at Christmas with a loaf of homemade bread. With this recipe they will be getting a nice new treat!!! I also made a couple batches of zuchinni jam this year. The people that tried it cant believe it is zuchinni its fantastic just like your recipe. Thank you again!! Thanks for stopping by. Let us know what jelly you make. Purple hull pea jelly is a favorite at my house. I make it and Crowder hull jelly which taste somewhat like apple jelly every year. The kids love it! I’ve been looking for a good recipe got cantaloupe jelly. Thanks! Thanks for visiting this site. I sure am learning something new since I have never eaten Purple hull peas nor Crowder Hull peas. I have eaten blackeyed peas. Many of the gardeners in my community garden grow some variety of cowpeas but I am not sure which kind. What color is the Crowder Hull Pea jelly? And are you using the fresh hulls or dried ones? Have fun with the cantaloupe jelly. How much pectin? I see where you state 1 package, I’ve seen it in 3 oz and 6 oz packs. My Ball No sugar needed fruit pectin is 1.75 oz. It takes 3 or 4 Tbsp for each recipe. I most recently bought it in 4.7 oz containers but still spoon out the 3 or 4 Tbsp. I am glad you found my blog. Cantaloupe jelly was a hit among all my friends too. Glad you were able to be successful with it. Have you tried doubling this recipe. If so would I need to double the sugar amts? Your receipe came out perfect. But I have a lot of cantalope and would like to make larger batches. Thank you for visiting Texas Jelly Making. I am glad to hear that your jam came out great. Doubling a recipe makes it much more likely that it will not set or jell for you. When I have lots of fruit I just make several batches side by side on the stove. quick question can I can this recipe? I don’t have freezer space and I purchased some gorgeous cantaloupes from our local farmers market. Thank you for asking about one of my favorite jams. Yes, it is possible to can cantaloupe jam but you will want to find a recipe that is has more sugar than mine. Either way it will be tasty! I Made This Yesterday But Canned It. Is It Suppose To Be Runny? Could It Be The Brand Of Pectin I Used? Normally I Use Ball Low/No Pectin But I Had A Box Of Sure Jell Low/No Sugar Pectin And Used It. This Is The 1St Time I Used Sure Jell And it’s The 1St Time My Jam Came Out Runny. I too use Ball No-Sugar Needed Pectin and even Ball admits it comes out runnier than their regular recipes but I always add an extra Tbsp of pectin to my recipes to make sure they don’t come out too runny. I also let it hard boil an extra 30 seconds. I find that every batch of jam or jelly is different because one might have riper fruit, more water, less water, or other factors involved. I also find that when I freeze the jam it becomes a little more runny (not a factor for you since you canned it). I really don’t think using Sure Jell Low/No Sugar Pectin was the difference. If it was some off-brand I had never heard of I would suspect this but not as likely with Sure Jell. Hope this helps. Thank you so much for the info. I’m thinking like you said, “riper fruit, more water” may have been the culprit and to add a little more pectin. Still learning the ropes when it comes to canning and altitude. I have only been doing it for a year. My 1st time canning I made strawberry jam and it was a complete flop. It was more like fruit leather 🙂 Thank you again. (I apologize if you have already answered this question.) I would love to make this jam, but I don’t do freezer jam–space at a premium–so I wonder if there is any reason not to water bath it and store on the shelf. Thanks for the answer! I tend to think that I would keep this a freezer jam since I haven’t seen other recipes for this jam that are made to be put in a water bath. I can’t give you a definitive answer for this. Sorry. Making my freezer jam for the second year in a row. Had just found this recipe after picking my last 4 mellons last year. They didn’t last 5 months. Now I am getting ready to make up about 6 more mellons. Some for freezer, some for canning. Love the taste. Brenda- Glad you enjoyed the recipe. It makes a very tasty and pretty jam. My garden is too small to grow melons often but I would make melon jam every year if I could. Can you use honeydew melon in place of cantaloupe? Lindy- I see no reason you couldn’t. Just remember that this recipe is for freezing, not canning. It is not acid enough to safely be canned.